A child’s imagination is the thing of wonder. Their minds can transform a box into a spaceship, a blanket fort into an impenetrable castle. They can go from running from prehistoric dinosaurs one minute to fighting superheroes the next. Almost every child, like their parents before them, has pretended to be a doctor, lawyer, teacher, or police officer at one point or another, and while the main point is obviously to have fun, did you know that it actually helps with your child’s development? 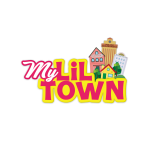 My Lil Town is a brand new indoor playground in Granada Hills that is unlike anything you, or your child, has experienced. Our play center is, as our name suggests, is its own little town made up of “stations” that let the children roleplay multiple real-life situations and occupations. Pretending to live in a town of their own as a grownup will certainly be a blast for them as it is, but the best part is that they’ll be learning the entire time as well! 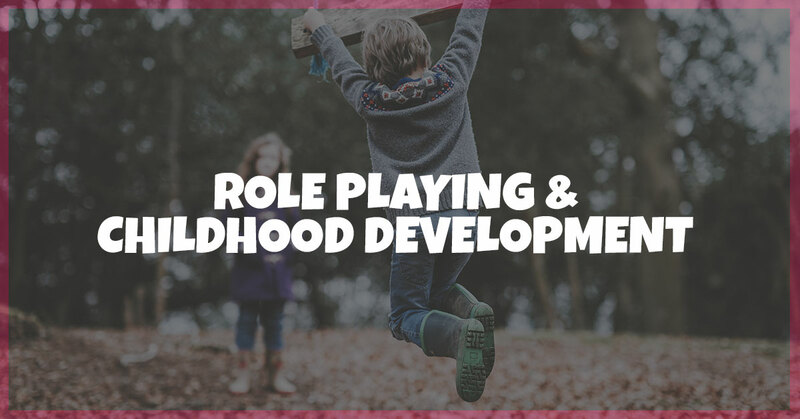 In this blog post, we’ll provide you with a few ways that roleplaying helps your kiddo grow and how our kids’ play area is the ideal place for it. If you’d like any more information or would like to schedule a tour of our facility, then feel free to contact us today! One of the most obvious benefits that come with role-playing is letting your child’s creativity and imagination to run wild! Using their imaginations as often as possible lets your young one develop cognitive skills that will help all throughout their lives. Just because, as adults, we don’t pretend to be astronauts and aliens any more (maybe you still do, you’ll get no judgment from us!) doesn’t mean that being creative isn’t necessary for our day-to-day activities. From solving a problem at work to coming up with a joke to make your friends laugh, using your imagination is key. 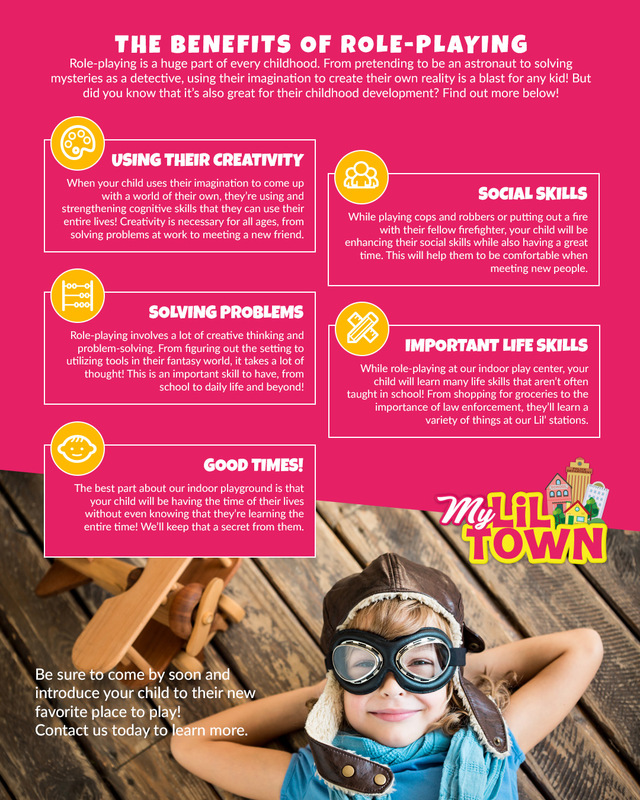 By promoting creativity at a young age, you’ll be helping your child develop these skills. And you know what? It’s pretty darn fun to join in with them! Pretend to be one of their students at our My Lil School station or have them give you some change back at My Lil Bank! While they’re having a great time pretend-playing at our indoor playground, your child will be interacting with other kids their same age and learning together! By pretending to be firefighters or police officers, they’ll not only be expanding their knowledge but also making friends and improving their social skills! The ability to work and have fun with others is incredibly important for child development. This skill will help them make new friends at school, work well in groups, be kind to strangers, and so much more. While roleplaying, there are a lot of problems that need to be solved, even from the get go! Who is going to play what? What is the situation? How are the props to be used? At our indoor play area, this cognitive skill is taken to another level! Your child will gather a more clear understanding of the outside world and certain problems that are likely to arrive and how to solve those problems. 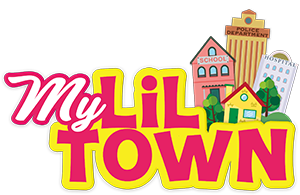 From the simple act of filling a car up with gas to the more difficult act of counting money, they’ll learn it all at My Lil Town! We’re proud of the fact that we’re not only providing fun and memorable times for visitors to our little town but helping them learn valuable life skills as well. Each one of our stations serves a purpose and teaches them lessons that they’ll be able to use in the outside world as they grow older. It’s not often that they are taught how to shop for groceries, the basics of medical care, or the importance of law enforcement in their school books at home. Here, they’ll not only learn these skills but have a great time while doing it. Our main goal here at My Lil Town is to provide your child or children with a safe place to learn and have fun. Along with our stations, we also have climbing walls for them to ascend, a jungle gym, a ball pit for the young ones, and more! Role-playing is one of the most entertaining and beneficial things for children, and our indoor playground in Granada Hills is the perfect place to do it! Keep an eye out for our grand opening, but in the meantime, if you have any further questions or would like to come and look around then don’t hesitate to call! We’re so excited for you and the children to see our facility and just how special it really is. To get an idea, view this virtual tour now. See you soon!